Our Feta has been named one of the best cheeses of the year by Culture Magazine. The list of 101 award-winning cheeses will be featured in The Best of the Year in Cheese special edition. In 2013, The American Cheese Society Competition took place in Madison, Wisconsin. Our Feta took a 1st place in the category for goat milk Feta, Hopelessly Bleu won a 2nd place in the category of: “Blue-veined with an outside rind or external coating made from goat’s milk”, and the Basket Molded Plain Chevre won a 3rd place in the category of: “Fresh Goat Cheese – Hand shaped, formed or molded”. In 2012, The American Cheese Society Competition took place in Raleigh, North Carolina. Our Hopelessly Bleu took 1st place in the category for “Blue-veined with an outside rind or external coating made from goat’s milk”. In 2011 The American Cheese Society held it’s competition in Montreal, Canada. Hopelessly Bleu won a 2nd place in the category of: “Blue-veined made from goat’s milk”, and the Basket Molded Plain Chevre won a 2nd place in the category of: “Fresh Goat Cheese – Hand shaped, formed or molded”. In 2010 The American Cheese Society held it’s competition in Seatle, WA. We are happy to report that Pure Luck took home 3 ribbons! Our Feta won a 1st place in the category of: “Feta made from goat’s milk”, Hopelessly Bleu won a 2nd place in the category of: “Blue-veined made from goat’s milk with a rind or external coating”, and the Basket Molded Plain Chevre won a 3rd place in the category of: “Fresh Goat Cheese – Hand shaped, formed or molded”. In 2009, the American Cheese Society competition took place right here in Austin, TX. A full write up is HERE. The Hopelessly Bleu won 1st place in the category of Bleu Cheese made with Goat’s Milk. The Basket Molded Chevre also won a 1st place in the category of Fresh Goat Cheese – Hand Shaped, Formed or Molded. Lastly the Feta won a 3rd place in Feta made from Goat’s milk. In 2008, the American Cheese Society competition took place in Chicago, Il. The Hopelessly Bleu won 2nd place in the category of Bleu Cheese made with Goat’s Milk. In 2007, the American Cheese Society competition took place in Burlington, Vermont. Pure Luck won a First Place Blue Ribbon for the Del Cielo in the category of Soft Ripened Cheeses made from Goat’s Milk. Another First Place Blue Ribbon was won for the Red Pepper Basket Molded Chevre in the category of Flavored Cheeses made from Goat’s Milk. Finally, we tied for Third Place for the Hopelessly Bleu in the category of Blue Molded Cheeses made from Goat’s Milk. The 2006 American Cheese Society judging took place in Portland, Oregon. Amelia Sweethardt, our head cheese maker and Ben Guyton, her fiancé were on hand to receive the awards. 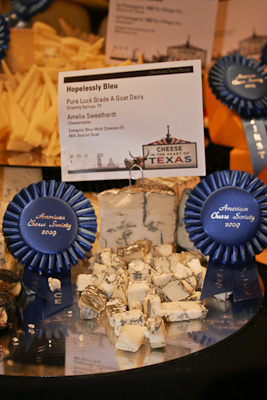 Pure Luck won a First Place Blue Ribbon for Hopelessly Bleu in the category of Blue Mold Cheeses, Blue-Veined Made from Goat’s Milk. A Second place was won for Pure Luck’s very popular Feta in the category of Feta Made from Goat’s Milk. A Third Place in the category of American Made International Style for Ste. Maure and a Third Place for Del Cielo in Soft Ripened Cheeses Made from Goat’s Milk. The annual American Cheese Society judging took place in Louisville, Kentucky, and Pure Luck won a third place ribbon in the category of Soft Ripened Cheeses in Cheeses Made from Goat’s Milk for the very popular Del Cielo. Pure Luck received an third place for the Basket-Molded Chevre in the open category made from goats’ milk at the American Cheese Society Judging which took place in August at Milwaukee, Wi. 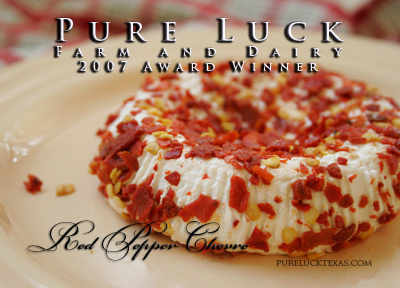 SAVEUR Texas Hill Country Wine & Food Festival has announced that Pure Luck Dairy has been selected as the winner of the 2003 Saveur Authentic Stars of Texas award. This award honors artisans who create and preserve the gastronomic bounty of Texas who help give the Lone Star State its unique flavor. The results are in, and Pure Luck was awarded five ribbons at the prestigious American Cheese Society judging held August 2003 in San Francisco. Hopelessly Bleu, Chipotle, Chive, and both plain Chévres (Basket Molded and Restaurant Pack) all won third place. 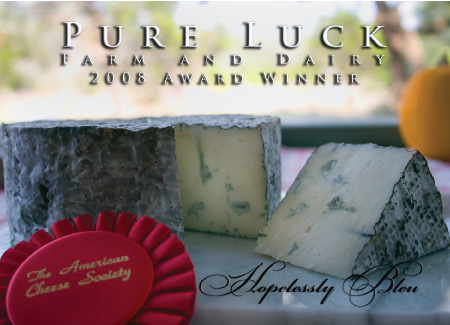 In August of 2002, Pure Luck was awarded three ribbons at the American Cheese Society Judging in Washington, D.C. A Second Place Red Ribbon for Feta (second year in a row for this honor), a Second Place Red Ribbon for its new Fresh Parsley & Garlic Spread and a Second Place Red Ribbon for Basket Molded Chevre. In the 2001 Judging, Pure Luck won a first place for the Basket Molded Chevre in the Farmhouse category – made with goat’s milk, a second place for the Feta in the category of Feta made with goat’s milk, and a second place for the Sainte Maure in the category of Soft Ripened Cheese made with goat’s milk. In 2000, Pure Luck received a first place for Fresh Goat Cheese in the Open category for fresh goat cheese at the American Cheese Society Cheese Judging in Rohnert Park, California. In 1999, Pure Luck received a first place for the Basil Pesto Spread in the category for Cheese Spreads made with goats’ milk, a second place for Fresh Goat Cheese in the Open category for fresh goat cheese, and a second place for the Sainte Maure in the American-Made International Style category made with goats’ milk. In 1998, Pure Luck received a first and second place in the Farmhouse Cheese made with goats’ milk category. First for Queso del Cielo ripened, and second for the Plain Chevre. We also received a second place in the Fresh Goat’s Milk category for the Farmstead Chevre, and a third place in the Soft Ripened Cheese category for the Queso del Cielo.